Scar Control works. This breakthrough topical treatment is designed to reduce and help eliminate old and new scars while promoting healthy and balanced skin. Treatment features our famous dual modality approach to remedy scars and scar tissue. It combines certified organic homeopathic medicines, which dissolve scar tissue, and soothing botanicals to nourish damaged skin. These added botanicals expand and support the action of the homeopathics. This is a one of a kind proprietary formula manufactured and distributed only by Forces of Nature. It works. Scar Control is Real Medicine. It is an advanced treatment approach to healing scars. 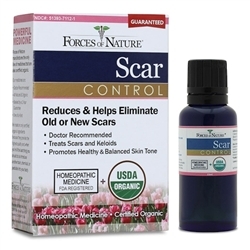 This breakthrough remedy merges condition specific soothing botanicals with the power of recognized and established homeopathic drugs to treat scars. Its formulation is based on 11 years of research and development, culminating in its approval for over the counter sales. Some of the leading doctors and medical professionals in the industry combined efforts to formulate this revolutionary treatment. Lead product developer and company founder, Mr. Peter Klapper, plant medicine specialist and biologist, literally travelled the world to source the medicinal plant material needed to produce this treatment. He has developed relationships with growers of certified organic medicinal plants across the globe. The therapeutic material is flown in directly from these certified organic growers from Nepal, Madagascar, Australia, South Africa, the French Alps, etc. to our USDA Certified Organic facility. It is then re-quality checked and precision blended by hand into our treatments. Our treatments are USDA Certified Organic. We only use Certified Organic ingredients because they provide the highest quality and concentration, plus we believe when you're sick the last thing you should do is introduce another toxin, pollutant, or pesticide into your body. All Forces of Nature products are manufactured in the United States at our USDA Certified Organic and FDA Registered drug facility. We are so confident in our products they are all backed by our one-year, money-back guarantee. Forces of Nature is ONE OF A KIND, ADVANCED, POWERFUL, BREAKTHROUGH MEDICINE. No other company delivers our combination of 2 in 1 treatments, which are also Certified Organic. We are very proud to have this opportunity to offer it to you. The letters 'HPUS' indicate that the component(s) in this product is (are) officially monographed in the HomÅ"opathic PharmacopÅ"ia of the United States. To reduce and eliminate scars. Simply rub one to three drops into area of treatment. Apply three times per day. As with any drug, if you are pregnant or breast-feeding, ask a health professional before use. Not for use on children under age of 3. For external use only. Some individuals may be sensitive to essential oils, skin test for tolerability. If accidental ingestion of more than several drops, and adverse reaction occurs, get medical help or contact a Poison Control Center. Do not apply to the eyes; in the event of contact, flush with water and seek advice from medical personnel. Keep all medicines out of the reach of children. It was very easy to order by web. Store carrying your products is 1 hour away from my home. I have purchased several of your products and always received good service with prompt delivery. Purchased online via your webstore, quick shipping. Overall purchasing experience was good. This product did make a difference. We are repeat customers now! The Scar oil is something that should be in every medicine cabinet. I am going to ask the company to make a larger bottle for me because I have lots of scars that I use it on and what a difference it is making! The Acne Control Oil is fabulous--it is the only thing I have found that comes close to doing what it says. My acne-adult acne-is almost gone. The oils are concentrated so that a little goes a long way. 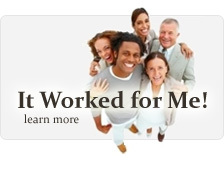 I am so pleased with the products--and the service is great. Order the products and they are at your doorstep in just a few days--not weeks like some places. The people really care about their customers. I highly recommend this company. I have a testimonial for your product Scars No More. I have Lupus and have a severe butterfly rash that covers 90% of my face, neck and ears. I have tried everything known to man to treat and mask this rash and until now, everything else has either irritated my skin or failed. I received an email from my mother about your product and decided to give it a try based on other people's testimonials. I placed an order for a bottle about two weeks ago and have used it as directed every day since. My skin is beginning to show MAJOR signs of improvement. The scabs around my ears and eyes are clearing up as well as the skin on my face is not as dry and flaky anymore. Co-workers have commented that my face looks a lot better and is not as red as usual. I am a 41 year old man who has had this dreadful disease for 17 years now. In the past, I avoided crowds and busy places because of the stares and rude people asking questions. With the recent improvements that your product has had on me, I feel more confident to 'show-my-face' in public again.